Come and discover our innovations ! Aromatech has exhibited at the Djazagro Algeria from February 25th to 28th. The opportunity to highlight our new production area (Blida) an R&D center. We have the pleasure to exhibit again with our partner (UREN) at the FOOD MATTERS LIVE (London). 20-22 November 2018. Be the first to discover our innovations and trends ! We have always focused on quality and natural, discover our knowledg through a delicious tasting session ! Aroamtech organized the 10th edition of the Food & Drink Industry International Pro Am on Friday, June 15. We celebrated this new success with main actors of the food and drink industry. 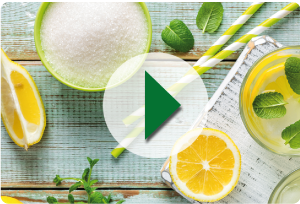 AROMATECH and BRENNTAG, worldwide leader of the distribution of food ingredients, come together on the French market, starting January 2018 ! The success of this partnership is based on the union of a strong commercial position of Brenntag France and the expertise and creativity of the Aromatech group. Creator of flavors inspired by nature, Aromatech distinguishes itself by its high certification as well as its wide range of flavors, natural flavors and its expertise in certified organic flavors. With solutions recognized and acclaimed around the world, Aromatech has become the worldwide specialist of this high-growth segment. Its creativity and capacity to develop innovative and adapted aromatic solutions allows its customers’ ambitions to become reality. With a strong ground commercial team of 12 people, Brenntag is the first French distributor of food ingredients. Its success is based on strong and essential values such as a local anchoring, a technical expertise and an excellent knowledge of its markets. Additional skills which will allow to offer a real support as well as complete and adapted solutions to the needs of the customers. Present in more than 74 countries, distributor of food ingredients, Brenntag is the historical partner of the food-processing industry. Aromatech wishes you all the best for this new year ! Aromatech exhibited on the Gulfood Manufacturing﻿ Dubai with its partner FSL. With its English partner Uren, Aromatech also exhibited on the Food Matters Live. Aromatech is pleased to announce the Grand Opening of its new factory in Bangkok, Thailand. The company has been established since 2003 and just moved in a new building, after several months of work. 1500 m² dedicated to the design, the production and commercialization of food flavors to meet our customers needs. Our Mamey flavor highlighted ! Discover an article on our exotic Mamey flavor in the food magazine Confectionery News.com ! Aromatech launched a Kulfi flavor, an Indian taste. Its typical organoleptic profile - rose, pistachio, spicy - evokes kulfi, this traditional Indian ice cream. Discover an article on our international tastes: Kulfi, crème brûlée, blueberry cheesecake, fresh herb﻿s. Our flavors have been developed by our subsidiaries. Our flavors has been developed by our subsidiaries. With a natural expertise, discover our natural flavors for beers and alcohol free beers through a French article. Aromatech exhibited at the Djazagro Algeria from the 10th to the 13th of April 2017, a success ! Aromatech exhibited at the Djazagro Algeria from the 10th to the 13th of April 2017﻿. The opportunity to highlight our new range Fruitalys, developed for artisans bakers, pastry chef, ice-cream maker, confectioner, beverage manufacturer, chocolate maker and restaurant owner. Aromatech lance sa nouvelle gamme Fruitalys au Djazagro ! Vous êtes artisans/industriels pâtissier, boulanger, chocolatier, glacier, confiseur, restaurateur, fabricant de boissons ou produits laitiers ? A PROPOS DE FRUITALYS ? La société Aromatech a développé une gamme d’arômes liquides et pâtes spécialement conçue pour vous offrir le meilleur du goût : Fruitalys. La gamme Fruitalys 1L & 1 KG a été conçue pour répondre aux besoins des artisans et industriels : boulanger, pâtissier, glacier, chocolatier, confiseur, fabricant de boissons /sirops & produits laitiers ainsi que restaurateur. Fruitalys offre également aux particuliers une sélection d’arômes liquides et colorants à un format 30ml adapté. Aromatech at the CFIA exhibition - Rennes, see you in 2018 ! A new edition on the CFIA exhibition, see you in 2018 ! What do you think about NATURAL & BURGER? Aromatech developed a new range BEER & BURGER with more than 20 flavors in 12 delicious sauces. A good burger is more appreciated with a fresh beer, that's why Aromatech developed flavors for beer (beer & fruit flavors). Aromatech presents its new ranges AROMATOP FISH & AROMATOP VEGGIE. AROMATOP FISH is a selection of seafood flavors especially created to offer the best to customers. AROMATOP VEGGIE is a selection of vegetables flavors, including a selection of organic & natural flavors. Discover our CLEAN LABEL, ALLERGEN FREE & HALAL SUITABLE flavors ! Aromatech has been highlighted in the Orlando Business Journal about our new factory. Discover the article in the section NEWS & MEDIAS-->PRESS REVIEW. The peanut revolution with our new Innov'flavor without allergen ! Aromatech developed a peanut flavor without allergen. A delicious organoleptic profile: fatty, slightly sulfury, fresh peanut. Aromatech is highlighted in a press article on flavored beers (Process Alimentaire magazine / July 2016). Discover our flavor of the month, developed by France. Aromatech USA has exhibited at the IFT Chicago, July 16-19. An inescapable exhibition ! The opportunity to highlight its new factory in Orlando. The 9th edition of the leading golf tournament for Food & Drink professionals, the Aromatech Trophy, took place on the 17th of June 2016. This event is now an unavoidable meeting which happens on an exceptional golf course: the Royal Mougins Golf Club, one of the most prestigious and beautiful golf courses of the French Riviera. This new edition reached again a great success thanks to participants’ enthusiasm and to the atmosphere combining competition spirit and conviviality. Discover in our PRESS NEWS an article on our Africa range. The Food Manufacturing Africa magazine﻿ gave one page on our new range to highlight our African flavors. Discover our monthly flavor developed by Thailand: BANOFFEE. A delicious and innovative flavor, perfect for ice-creams, yoghurts and desserts with its creamy profile (ripe banana, creamy, chocolate and caramel). Discover our flavor of the month developed by France: cashew nut. The perfect flavor for dairy products and chocolate with a fatty, burned and vanillic profile. Aromatech is represented on the Nigeria Food exhibition from the 26th to the 28th April 2016. Its new range "AFRICA" is highlighting during 3 days. Meet Aromatech on Mekz's booth A.4.3﻿. Discover our cocktails flavors ! A selection of delicious cocktail flavors to surprise your consumers. Confectionery, beverages, dairy products, bakery / pastry...it's time to try ! Our Tandoori flavor in a French magazine ! Aromatech developed with its subsidiaries a mango range with more than 15 mangoes. Discover also a selection of mangoes with declared origins. Aromatech Group offers the mango in all its forms ! Aromatech France is expanding ! Aromatech Group is pleased to announce you the inauguration of its new building on springtime 2016. This building is going to adjoin the Aromatech factory of 2 500 m² (26 909 ft²) located in Grasse (France). It will reinforce our industrial department to answer our cusotmers needs.
" Develop our performances to perpetuate our customer satisfaction, one of Aromatech goals in 2016 "
We have the pleasure to sponsor a talented French racing driver, Aurélien PANIS - Formula Renault 3.5 Series, last step before F1. Aromatech is sharing this sport's ambition. Good luck to Aurélien ! Aroamtech exhibited on the CIME, China International Meat Industry Exhibition. New award for Aromatech ! Aromatech has received on December 18th, a new award for his international development. An award from Le Club de l'Eco / Nice Matin (french media). An award won by the work of all its employees. Link to our Corporate moovie. Discover our origins trough this short moovie. Aromatech won the INTERNATIONAL DEVELOPMENT TROPHY ! Organized by the Bank “Société Générale”, les Chênes de la Méditerranée, "Trophies of the family business" highlight the founders, executives and employees of family businesses in Provence-Alpes-Côte d'Azur, Languedoc-Roussillon and Corsica. Among 160 participants, the results were announced on Thursday, June 19, 2014 at the Palais du Pharo in Marseille (FRANCE). A real moment of emotion and surprise, Aromatech Group won THE INTERNATIONAL DEVELOPMENT TROPHY ! Under a permanent concern to provide full quality products and services to its customers, Aromatech SAS has invested in its European manufacturing site for several months, necessary human and financial resources for the implementation of the FSSC 22000 certification. This new protocol of certification extends the ISO 22000 perimeter (obtained by AROMATECH SAS in February 2013) by strengthening requirements for food safety of manufactured products. It also provides international recognition by the GFSI as an equivalent to IFS (International Food Standard) and BRC (British Retail Consortium). These two standards were set up by distributors to define the rules of hygiene, quality and food safety in the manufacture of food products. Both are more demanding as requiring an obligation of means. The FSSC 22000 certification being successfully achieved, Aromatech is strengthening its capacity to achieve its main objective: to offer high quality products to meet customer needs and in compliance with the legislation in force. Some companies require this certification for a possible collaboration, a new opportunity for Aromatech to develop new projects. Aromatech Group just obtains the double ISO 9001 & 22 000 certification from Bureau Veritas for its European industrial site and headquarters, based in St Cézaire sur Siagne, near to Grasse. The ISO 22 000 certification attests that food flavours produced and marketed by Aromatech meet food safety requirements set out by this international standard. The ISO 9001 standard ensures that the quality management system aims the customer satisfaction. For over 5 years, Aromatech Group already applied the HACCP principles, for which it was audited and validated by Bureau Veritas in 2009. To go further in its quality policy, Aromatech invested for several months in human and financial resources necessary to achieve the ISO 9001 et 22 000 certifications. Today, with this ISO 22 000 & 9001 certification, Aromatech strengthens its quality policy to achieve its main goal: to offer to its customers quality and safe products, which meet and/or anticipate their requirements in accordance to regulations.